Explanation: What's that next to the Moon? Jupiter -- and its four largest moons. Skygazers around planet Earth enjoyed the close encounter of planets and Moon in 2012 July 15's predawn skies. And while many saw bright Jupiter next to the slender, waning crescent, Europeans also had the opportunity to watch the ruling gas giant pass behind the lunar disk, occulted by the Moon as it slid through the night. 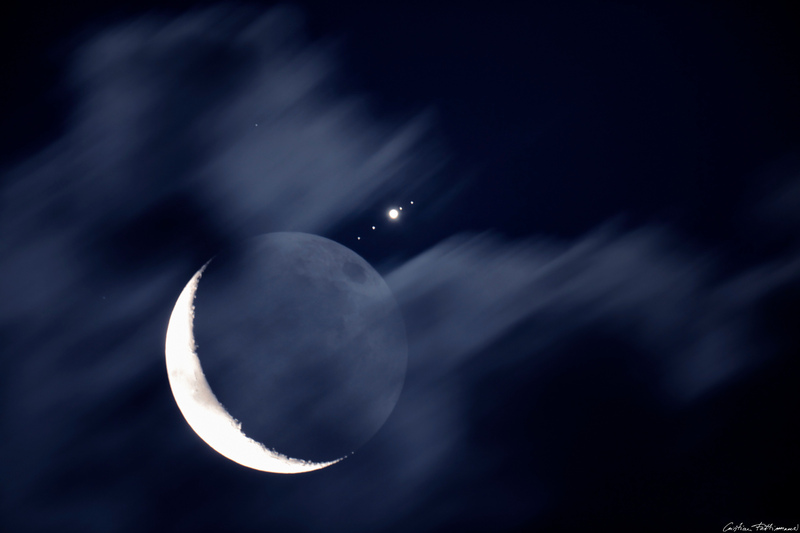 Clouds threaten in this telescopic view from Montecassiano, Italy, but the frame still captures Jupiter after it emerged from the occultation along with all four of its large Galilean moons. The sunlit crescent is overexposed with the Moon's night side faintly illuminated by Earthshine. Lined up left to right beyond the dark lunar limb are Callisto, Ganymede, Jupiter, Io, and Europa. In fact, Callisto, Ganymede, and Io are larger than Earth's Moon, while Europa is only slightly smaller. Last week, NASA's Juno became the second spacecraft ever to orbit Jupiter.